Tripp Lite's 1.83 m (6-ft.) SXGA/UXGA Monitor "Y" Splitter cable provides an inexpensive alternative for splitting the video signal from your PC's VGA port to 2 High-Resolution monitors that use standard 15-pin plugs. 75-ohm coax conductors used for RGBHV signals allow for use with monitors with up to 1600 x 1200 resolutions. Perfect for laptops to display on a separate, larger monitor. Use for short distance applications only. For applications that require longer distances and highest resolution, see Tripp Lite B114-002-R, powered 2-Port Splitter, or B114-004-R, powered 4-port Splitter. To extend your desktop onto a second monitor, see Tripp Lite U244-001-VGA-R. 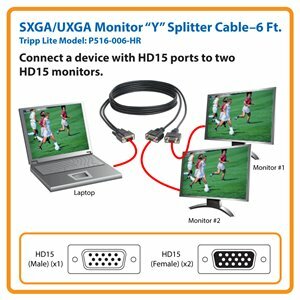 The P516-006-HR High-Resolution SXGA/UXGA Monitor “Y” Splitter Cable offers an easy, inexpensive solution for splitting the video signal from one VGA port for display on two high-resolution 15-pin monitors simultaneously. Featuring one HD15 male connector for a computer and two HD15 female connectors for monitors, this six-foot cable features 75-ohm coax conductors that support resolutions up to 1600 x 1200. To display different images on two monitors, add a VGA port to your computer with Tripp Lite’s U244-001-VGA-R USB to VGA adapter. Perfect for displaying the video signal from a notebook computer on two larger SXGA or UXGA monitors for easier viewing of presentations, the P516-006-HR is compatible with any PC or Mac equipped with a 15-pin female VGA CPU port. It’s designed for short-distance applications only (if you require long-distance video signal transmission, choose Tripp Lite’s B114-002-R or B114-0H4 video splitters). The P516-006-HR is manufactured using top-quality materials. Premium double shielding provides maximum EMI/RFI protection to ensure a consistent, clean video signal. The HD15 connectors have integral strain-relief for durability and long life. The P516-006-HR comes with a lifetime product warranty. It’s manufactured in compliance with strict RoHS specifications, reflecting Tripp Lite’s commitment to environmental responsibility. High-Resolution SXGA/UXGA Monitor “Y” Splitter Cable, 6 ft.